The Eastbrook Rosano range is available in matt white, matt anthracite and matt black. Complete the whole heating system throughout the house in this range by choosing from the other vertical and horizontal sizes that are available in the Rosano range. With a wide range of heights and widths in both vertical and horizontal models, the Eastbrook Rosano range has a radiator to fit in nearly any space in the house. The Eastbrook Rosano range can be used on a UK central heating system, as an electric only radiator or as a dual fuel radiator. Complete the look with a chrome cap set for the Rosano radiators. 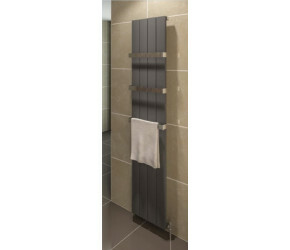 You can also choose from a variety of towel bars to go with the Eastbrook Rosano radiators to add another practical element to these beautiful radiators.